Nice! great price and looks amazing. For sure overstock was the best price. Perfect and arrived fast. I recommend this item because is perfect. 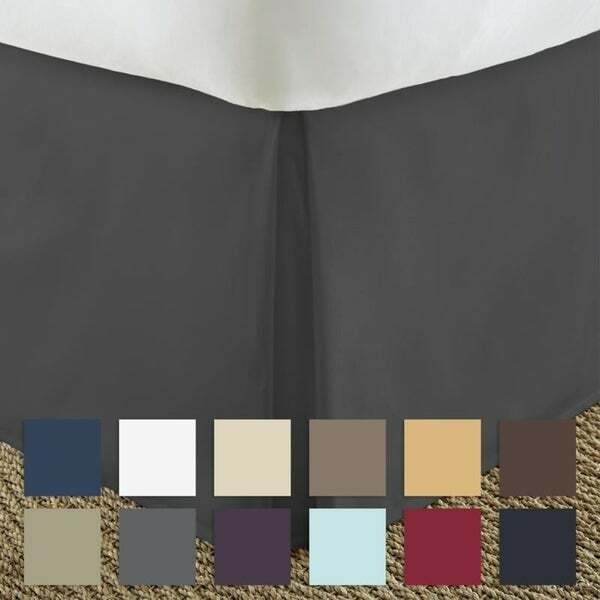 Add a classical, finished touch to your bedding with this Merit Linens pleated bedskirt. The beautiful, lightweight dust ruffle is crafted from machine washable microfiber, and is available in a variety of colors to perfectly suit your decor. The pleated corners give the bedskirt sharp and clean lines, making this ruffle the perfect way to hide unsightly bedposts and under-the-bed storage. This is not an expensive item so I didn't expect highest quality. The color is exactly what I wanted. I guess I should have measured before purchase as this bed skirt is a couple inches shorter than what I needed, but it will do until I find something better. It is being used in a spare bedroom. It is very thin and lightweight, but then it is a microfiber. Overall, average product. I purchased two of these and I was very please with both the fit and the quality of the materials. I just put them on this weekend and I would recommend them to anyone needing a 14 inch drop as it was better than I expected for the price. This is a nice product. Color was true. HOWEVER, I wish I would have measured as my bed is much higher than a 14 inch drop. I didn't realize that there was a difference???? Very happy with this purchase. Fabric is on the light weight side but after ironing it hangs beautifully. Hard to find 12 inch bed skirts. This worked out just fine. Color is perfect. Had to iron the skirt and it is not as soft as I thought being Egyptian cotton. There's more body than I expected which is not necessarily a bad thing. I like the color & size. I gave it 3 stars because it would have fit better if it had slits at the corners. Anticipating it would at least slightly resemble the online color. With the name cream I was thinking a darker milk color. If cream was this color it would be quite spoiled. A light tan, beige. Awful. Sent it back. For reference the skirt is on top of my ivory duvet. Nice quality and colors. I ordered 2, one for winter and a color for spring. Highly recommend. Sized perfect and fast delivery. Very reasonable price as well. soft to the touch and the price was perfect. The color is just what I was looking for to match a bedspread. Good product. I would buy again or recommend to a friend. Good fit; quality of cloth alright. After I ironed this bedskirt it looked great! It Fits a queen bed well. I bought it to go with the Porch & Den Fairfield Dobby Striped Duvet Cover, I just ordered. They look great together! Very happy with the quality and feel of this cover. Very nice quality bedskirt. Good drop. Great color. True to description. 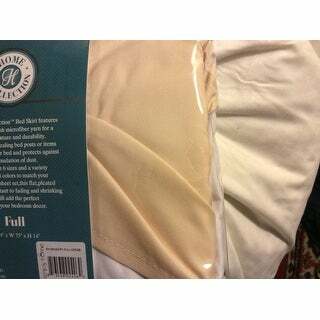 The material if this bedskirt is luxurious and doesn't fray when washing or drying. Wrinkle free so no need to iron and the pleating makes a very elegant look to the room. Perfect fit. Colors exactly as indicated. Perfect bedskirt for my son’s bed and great price too. "Does the "light gray" color bedskirt have a lavender/gray hue, or a blue/gray hue?" I would say it's closer to a traditional light grey and doesn't really have either a blue or lavender hue. "does this bedshirt go completely under the mattress or is it an elastic skirt that just goes around the sides of the bed?" It goes over the mattress. the bedskirt has a white thin fabric pflat top to fit under the mattress. 14 inch drop makes it standard for most beds on its drop to the floor. The bedskirt has a white thin fabric flat top to fit under the mattress. 14 inch drop makes it standard for most beds on its drop to the floor. "Need confirmation of dimensions between widths of King vs. California King. Normally California King is wider than the normal King? Description seems backwards?" Description is correct. The california king is longer and a few inches narrower than a king. "What is the length to floor of bed skirts?" The drop is 14 inches. the 14" drop length was spot on for my situation. I am so pleased with this dust ruffle! It's perfect. "Hi- Is this a 3 or 4 side bedskirt?" 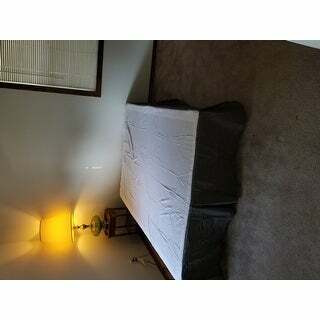 "Are the front corners open to go over bed frame?" This bed skirt does not have split corners.